Posted 04.10.2016 at 09:10 in blog by admin / Comments Off on How can Dental Bridges enhance my smile? Complete set of healthy natural teeth impart pleasant and charming appearance to your overall esthetic profile whenever your teeth are displayed during smiling, laughing, eating and speaking. Loss of natural teeth leading to the creation of unsightly appearance of gaps between remaining teeth not only ruins your facial appearance but also results in the loss of self-esteem, confidence and appeal at your work places. Get in touch with Albuquerque New Mexico Cosmetic Dentist now! Complete set of healthy natural teeth impart pleasant and charming appearance to your overall esthetic profile whenever your teeth are displayed during smiling, laughing, eating and speaking. Loss of natural teeth leading to the creation of unsightly appearance of gaps between remaining teeth not only ruins your facial appearance but also results in the loss of self-esteem, confidence and appeal at your work places. People avoid attending family functions, social meetings and university class reunions in order to prevent the embarrassment of compromised smiles. Replacement of lost or missing natural teeth because of dental decay, trauma, injuries, accidents, periodontal and gum diseases and sometimes. Thus, as a result of management of diseases and abnormalities involving the oral cavity is extremely necessary. Because this is necessary for the improvement and modification of smiles and functional requirements of teeth. Removable dentures were the main stream management options for replacing natural teeth in the past. However, dentures fail to completely restore functions as well as esthetics due to their removable nature and propensity to get fractured and dislodged easily during eating, chewing, speaking and laughing. Get in touch with Albuquerque New Mexico Cosmetic Dentist for more information. Albuquerque New Mexico 24 hours emergency specialist cosmetic & restorative dentist Dr William C Gardner at NM Family and Cosmetic Dentistry PC offers optimum fixed replacement option for the restoration of lost structure as well function in your mouth. A. These are fixed replacement devices which are designed by attaching the artificial tooth to two or more adjacent dental crowns. Thus, it is through specialized procedures in the laboratory to achieve best possible shape, size, stability and strengt. Because this is helpful for restoring the natural tooth structure, function and cosmetic demands. 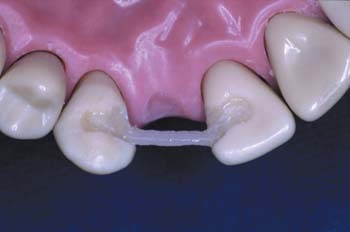 The artificial dental crowns make up important part of bridges by surrounding part or all of the natural adjacent teeth. Q. HOW DENTAL BRIDGES ARE FIXED IN THE MOUTH? Albuquerque New Mexico Cosmetic Dentist for your help! A. Dental bridges are fixed restorations placed in your mouth which are luted, screwed, cemented or mechanically attached to adjacent healthy natural teeth, roots of the teeth and/or dental implant abutments. Provision of retention, support, stability and strength are the basic functions of dental bridges. Thus, if you are in need of any help, give us a call. Q. WHICH MATERIALS ARE USED FOR FABRICATION OF DENTAL BRIDGES? Q. CAN ANYONE OPT FOR FIXED REPLACEMENT OF MISSING TEETH THROUGH DENTAL BRIDGES? Q. WHAT ARE THE BENEFITS OF PLACING FIXED DENTAL BRIDGES IN THE MOUTH? Q. DO I NEED TO CLEAN DENTAL BRIDGE LIKE NATURAL TEETH? A. Yes. Dental bridges require same degree of maintenance and care like natural healthy teeth. Regular brushing and cleaning helps for routine follow up consultation visits at least once or twice per year. If you have cosmetic defects in your teeth making your smile less pleasant owing to decayed, missing, crowded, crooked, mal-aligned or mal-posed teeth, you can visit your 24 hours emergency Albuquerque New Mexico dentist Dr William C Gardner at NM Family and Cosmetic Dentistry PC who is available throughout day and night and focuses upon best solution for improving your dental and oral health conditions. Call for Albuquerque New Mexico Cosmetic Dentist.